Does your child have trouble producing the K and G sounds? The K and G sounds should be mastered by age 3 1/2. Typically, a child who has trouble with /k/ and /g/ will substitute the /t/ and /d/ sounds, respectively. He is attempting to product the sounds with the tongue tip instead of the back of the tongue. These are fairly common speech sound errors, but a child who has these sound substitutions can be very difficult to understand. Here are some suggestions to help you teach these sounds to your child. To produce /k/ and /g/, the back part of the tongue is raised and pressed against the roof of the mouth (soft palate), stopping all airflow. The tongue tip is lowered. The tongue then drops, allowing the air that has been held behind the tongue to escape suddenly. The /k/ is voiceless, produced by airflow. The /g/ is produced with the voice "on." 1. Demonstrate the sound in front of a mirror. Use a spoon or popsicle stick to touch the back of the tongue and the soft palate or roof of the mouth to help the child feel how the sound is made. (Be cautious about triggering the gag reflex as you do this.) Have the child put his hand, paper, or a feather close to the lips to feel or see the puffs of air. 2. Help the child identify the part of the tongue to be raised by pressing downward on the back of the tongue with a spoon while the child tries to push upward against the spoon. 3. Have the child attempt to say /t/ while you hold the tongue tip down. 5. Exaggerate the target sound when modeling it. 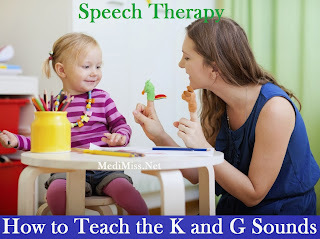 Have your child practice making /k/ and /g/ in isolation until he can easily produce the sounds. Then practice words that begin with these sounds. When this is easy for the child, have him practice words with /k/ and /g/ in the middle and at the ends of words. Only when the child can produce the error sounds correctly in words, should you require him to correctly produce the sounds in sentences.